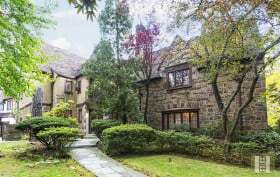 Check out this Tudor mansion at 70 Greenway South in Forest Hills Gardens. This Queens enclave is home to some of the finest–and most magnificent–freestanding Tudor homes in all of New York, and the neighborhood’s quiet and winding streets feel way more like a suburb than most of the city. This house, according to the listing, was “awarded First Prize for excellence in design and civic value in 1929.” While we couldn’t find more details on the award, it sure sounds fancy– there’s even a plaque up on the facade. The exterior is really impressive, with inlaid stone, a turret above the entryway, and a highly-pitched roof. You also can’t go wrong with a yard and a stone walkway out front, with another yard and two-car garage in back. But inside, this house is having an identity crisis. It’s medieval with a hint of…something.